THE LEGACY of Lady Augusta Gregory will be celebrated in the Lough Cutra Castle and estate, outside Gort in south Galway, next month. 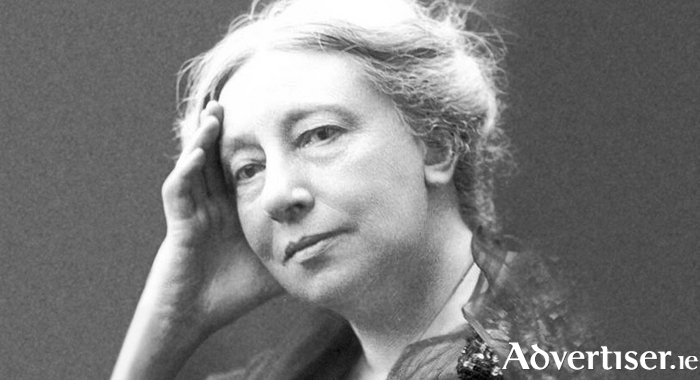 Lady Gregory’s Legacy, presented by The Yeats and Lady Gregory Heritage Trail, Galway, takes place on Saturday May 9 and Sunday 10 and is part of the Yeats 2015 celebrations. The castle was visited by Lady Gregory and WB Yeats when she lived on the neighbouring estate of Coole Park. The event will hear music from Tale of the Gael - Mickey Dunne (uilleann pipes/fiddle ), Robert Tobin (flute/whistle ), Catherine Rhatigan (harp/text ), Deirdre Starr and Tricia Keane (vocals ), Dave Aebli (double bass/bouzuki ), and Prannie Rhatigan (percussion ) - who perform traditional music mixed with classical overtones. The special guests are the Seven Woods Quartet from Coole Music, Gort. Doors open at 7pm. The concert starts at 8pm. Tickets are €30, including refreshments and finger food, and are available from McInerney auctioneers, Gort; The Lady Gregory Hotel, Gort; the Burren Lowlands Tourist Office, or [email protected]. Pre-booking is advised.